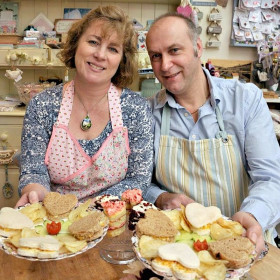 Situated in the beautiful village of Salhouse in the heart of the Norfolk Broads National Park, Judith and Martin welcome visitors and local residents to their truly wonderful ‘award winning’ vintage style tea rooms. Step inside this magical space where you can relax and enjoy home cooked lunches, cakes and bakes and of course a cuppa or two! Or come and visit and explore the amazing array of crafts and gifts available from over 40 local craftspeople and artisans. We have chosen to add a small donation of 20p on to one of our most popular cakes – our delicious Victoria sponge. These donations will help wildlife, conservation, education and the visitor experience in the Broads. We are proud to be involved with Love the Broads and support their fantastic work. “We were lucky enough to have been born and bred in Norfolk and live and work in the Broads National Park. Our tea rooms and craft and gift shop is very close to the wildlife haven of Salhouse Broad and we have the great privilege of welcoming many visitors that are attracted to this special place. 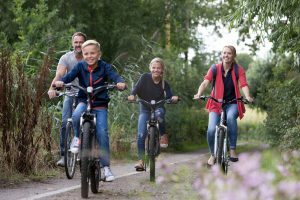 Whether they arrive by boat, cycle or walk there is always a warm welcome.